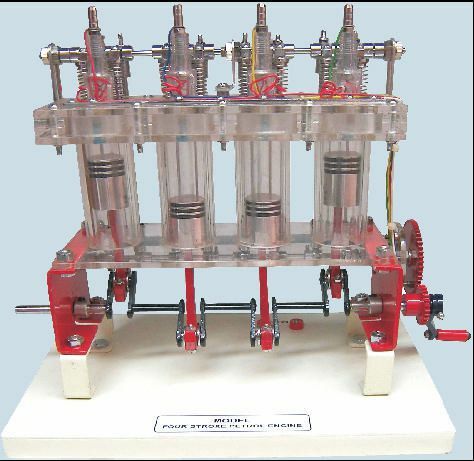 The model is made up of full size four stroke, four cylinders, used in petrol engines. The model is manufactured using high quality raw material and ensure long service life and is corrosion resistant. The maximum parts like four cylinders of the cylinder block, cylinder heads, valve parts, crank shaft piston, cam, connecting rod inlet and exhaust manifolds, throttle body, spark plugs etc. are sanctioned to clearly demonstrate the internal constructional details. The four stroke cycle are Intake, Compression, Power and Exhaust. Each corresponds to full stroke of the piston linked with revolutions of crank shaft. Intake: The piston move downward drawing a fresh change of air and fuel vapor pressure mixture. Compression: The piston rises and propell valve is forced to shut by increased cylinder pressure. Power: At the top of compression stroke, the spark plug fires igniting the misture of air and fuel. Exhaust: At the bottom of power stroke, the exhaust valve is opened by the CAM/LITTER mechanism. The upward stroke of piston drive the exhausted fuel out of cylinder.